Shrimp is mostly a low-calorie, low-fat food. It has over the years received bad publicity for its high cholesterol levels. However, it is a very good source of protein and many other mineral, vitamins and nutrients including omega-3-fatty acids which amongst other things are essential for the good health of your heart, preventing heart disease, high blood pressure and the like. Having said this, there are some individuals who are affected or are at risk for high levels of cholesterol from their diet. This means that things such as shrimp and eggs may not be ideal for them. If that be the case, one may need to consult their doctor first before including such foods in their diets. 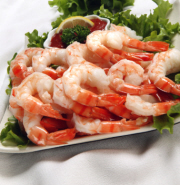 When you look at the nutrition facts of shrimp overall, you will realize that the pros outweigh the cons. Yes, though it may be high in cholesterol, it has many other nutritional benefits including being low in calories, low in fat, does not or rarely contains saturated fat. It is also of great nutritional value as it contains an array of nutrients, minerals and vitamins, most in significant amounts. Other nutritionists and dieticians have explained this cholesterol content issue by saying that since shrimp does not contain significant levels of saturated fat, the high cholesterol levels in it may actually improve the ratio of LDL to HDL cholesterol ("bad" : "good" cholesterol). This is in addition to lowering triglycerides. Shrimp nutrition facts show that they are a low-calorie, low-fat, low-carb, high in protein, iodine, Vitamin D, B-vitamins and Zinc food. This means that they are an excellent choice to include in your diet when you want to lose weight. 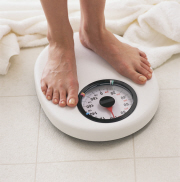 These minerals, vitamins and nutrients play an important role in aiding with weight loss. What Zinc does is that it increases the levels of the hormone Leptin. This hormone is especially important in the body. It is the one that is responsible for regulating your body's appetite, how your body uses up energy and fat storage. So whether you knew it or not, obsession with food, food cravings and over-eating is believed to be associated with low levels of the hormone Leptin. Another way in which shrimp aids in weight loss is by aiding the thyroid gland to function properly. This is due to its Iodine content. The thyroid gland is the one that is responsible for controlling the rate at which your body uses up energy when at rest. This means that when your iodine levels are low, it may result in your thyroid gland being slow in it's functioning possible resulting in further weight gain and conspiring against your desired weight loss goal. Shrimp also contains the trace mineral Selenium. This mineral is believed to be a constituent of an enzyme that has antioxidant properties. Antioxidants help the body to fight against free radicals which can bring about undesirable health effects including cancer. Selenium also helps to boost your immune system. This therefore means that shrimp can aid in the prevention of cancer as well as boost your immune system. Having said all this, there is no harm in adding shrimp to your eating healthy diet. When it comes to your skin, shrimp are also believed to prevent premature aging due to the carotenoids that can act as antioxidants. It's these antioxidants that also fight against free radicals which amongst other things cause premature aging. There are several ways in which shrimp may be prepared. They may be baked, fried, grilled or boiled. Shrimp tempura, shrimp cocktail, shrimp fried rice are some of the different types that we will discuss. We will now take a look at some shrimp nutrition facts. The percent daily values (DV) are based on a 2,000 calorie diet. Your values may be higher or lower depending on your daily calorie needs. 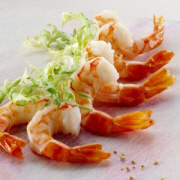 Raw shrimp nutrition facts reveal that it is low in calories and does not contain any fat and is low in sodium. It however does contain cholesterol. Raw shrimp is a source of quite a number of minerals, vitamins and nutrients including Vitamins A, C, E, B6, B12 as well as Calcium, Iron and Magnesium amongst others. It is also a good source of Protein and Vitamin D, providing you with 12% and 11% respectively of your recommended daily value. When considering cooked shrimp and its nutrition facts, we realize that is also low in calories, sodium and has no saturated fat. The cholesterol levels, however, need to be watched as they are heading towards the high levels. 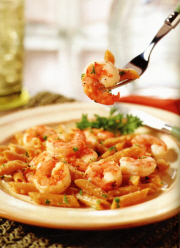 Cooked shrimp is a good source of Iron, Niacin and Phosphorus. In addition to these, it is also a source of several other nutrients and an excellent source of Protein and Selenium which have amazing benefits for your body. You may see the article of salmon nutrition facts to learn about some of them. These are nutrition facts for Panda Express' Honey Walnut Shrimp Kids. When compared to the cooked shrimp nutrition facts above, this Honey Walnut Shrimp for Kids is high in calories, total fat, saturated fat and fair on the cholesterol levels. 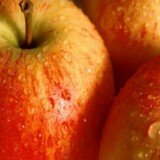 It is also a source of carbohydrates and dietary fiber. 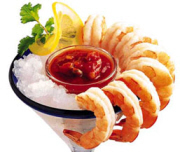 Shrimp Cocktail Sauce is also low in total fat and saturated fat. The cholesterol and sodium levels are a bit on the high side. One needs to watch how much of these (cholesterol and sodium) they consume as they may lead to undesirable health issues when in the body in excess. Nutrition facts on shrimp cocktail sauce show that it is a very good source of Dietary Fiber, Iron, Vitamin A, Niacin, Vitamin B12, Phosphorus, and Copper. It is also an excellent source of Protein and Vitamin C in addition to being a source and good source of many other minerals and vitamins. The good thing about shrimp fried rice according to its nutrition facts is that it is a source of Vitamin C, Dietary Fiber and Calcium as well as being a good source of Carbohydrate, Iron and a very good source of Protein. Shrimp Lo mein nutrition facts show that it is moderate in terms of its saturated fat and sodium content. We can also see that it is a good source of Carbohydrate, Dietary Fiber, Vitamin C, Iron and a very good source of Protein. Shrimp Egg foo young nutrition facts show that its total fat, sodium and saturated fat levels are a bit on the high side. Also, the cholesterol levels are above your recommended daily allowance. If you really must, you may indulge in this food once in a long while, just to satisfy your cravings!! Despite this, it is however a good source of many other nutrients, vitamins and minerals that your body needs including Riboflavin, Protein, and Vitamin B12 amongst many other. However, the highlight would be Vitamin A. 78% of your recommnded daily allowance of the vitamin is provided to your body when you eat this food. One of the things Vitamin A does for you is promote healthy eyesight. 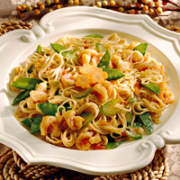 Scampi shrimp nutrition facts show that it also is high in its saturated fat and cholesterol content. It is however an excellent source of Protein, providing you with 52% of your daily recommended value of the mineral. Protein amongst many other things helps with the synthesis and repair of cells in your body.